Great News It’s that time of year again! The team at The Cavalry Construction Group has been hard at work getting ready for the BC Home and Garden Show at BC Place Stadium from Wednesday, February 22 through Sunday, February 26, 2017. This show is a great opportunity for homeowners to learn about the latest design trends and to meet our design and construction professionals. The Cavalry Construction Group are here as a team to guide you through the design of the your perfect landscape and/or home renovation project, and we look after all aspects of the construction of your project so you can focus on other priorities. It doesn’t get much easier than that! Visit our booth at the show and see why the owners of fine homes, estates and luxury properties are recommending The Cavalry for interior and exterior renovation projects. We are pleased to have a limited number of complimentary tickets to the BC Home and Garden Show. Request your complimentary ticket. You will also be able to book your project consultation with us at the show, right before the usual spring rush, and take advantage of our Spring promotion – We will give you up to a 5X credit on your initial consultation fee towards the cost of your project when you book or register for a project consultation by March 6, 2017 for any meeting date through all of 2017. We are also giving away a special ‘Tranquility Gurgler’ water feature (Retail value of $3,500*), or choose to receive an equivalent credit** towards the cost of ANY construction project completed by The Cavalry in 2017! Enter the draw at our booth during the show. We will draw the name of one lucky attendee at the close of the show on Sunday, February 26, 2017. *The water feature (the `Prize`) is described as a Basalt gurgler over a pondless reservoir, including one cored basalt column measuring approx. 30 inches to 32 inches tall, with 2 adjacent smaller Basalt columns. The total footprint of the feature is approx. 25sq.ft to 30 sq.ft. The Prize does not include adjacent landscape improvements, or supply of power or auto-filler to the feature. Site conditions may require installation of retaining walls or other details to correctly install the feature, the costs of which are not included in the prize value. A site visit in advance of installation is included to discuss the installation location and any specific considerations. The Prize is transferable (some terms and conditions apply) and the installation address must be within the boundaries of Metro Vancouver or the Lower Fraser Valley, excluding Lions Bay and Bowen Island. The prize has no cash value. **The equivalent credit of $3,500 would apply towards the total price of any construction project quoted by The Cavalry Construction Group between March 01, 2017 and December 31, 2017. Please confirm your interest to continue receiving inspirational landscape design messages and regional event information by clicking here. Before the chill in the air turns into harsh winter weather, prepare your decks, patios and sidewalks for the winter months ahead. The combination of foot traffic, food spills and weather can take its toll on any deck unless properly maintained. The first step to prepping your deck is always clearing it of any items that could be damaged or cause damage in the winter. Ensure you store and protect any cushions, mats & area rugs. Clean your deck thoroughly to remove the remnants of summer and get it ready for winter. Exposure to sun can cause wood to turn gray and exposure to moisture can create the perfect conditions for the growth of mold, mildew, moss and algae. Don’t forget your BBQ! After all of your summer entertaining, be sure you clean out your BBQ. Whether you grill all year long, or put it away until the spring, a clean BBQ will last longer without any surprises. With the cold approaching, be sure you blow out any irrigation systems. Water in pipes can freeze and cause bigger problems down the road. A winter must-have is lighting. With shorter days lighting is important for safety and provides the atmosphere for you to enjoy your outdoor spaces any time of the year. Consider adding more lighting to your landscape and your living spaces. Restore the Deck: As you clean your deck, you’re going to want to keep an eye for any damaged boards or other signs of damage on your structure – add these repairs to your spring list. Apply a Protective Finish: It is important to apply a water-repellent finish to protect your deck. Moisture such as ice, snow, sleet and rain can penetrate an unprotected surface, which can cause splitting, cracking and warping. Once your repairs are done, stain/seal your deck again and enjoy for another year. You have invested a great deal of time and money on your outdoor living space; you want to make sure your investment is protected. Contact us today and we’ll help you with all of your outdoor living space needs. Yes, summer is over and fall is well under way. The fall means colder and wetter weather but it doesn’t mean you can’t enjoy your outdoor living spaces. Your decks and patios are the centerpieces of your outdoor spaces, and you have invested a lot into them, so why start shutting down when the fall weather takes over? Don’t Pack It In – Even if the temperature dropped items such as planters, rugs, and furniture won’t mind a little chill. Anything in and around your deck should remain in place until the first snow fall. Consider adding, not taking away from the look of your outdoor spaces in the fall. Add Heat – When the sun fails to warm you up, all is not lost. There are lots of ways to heat up your outdoor space. Patio heaters have become increasingly popular. When choosing a heater for your deck, consider the space, how much heat you need and what kind of heat will work best for your needs? Creating a comfortable temperature will keep you and your loved ones outside longer. Lighting – Fall, with its shorter days, is the time to take advantage of any lighting you already have. It’s also a great time to consider adding more lighting to your landscape and your living spaces. Lighting is important for safety and provides the atmosphere for you to enjoy your outdoor spaces any time of year. Don’t let the end of summer be the end of good times on your deck. Our experts at Cavalry can help you prepare for the fall and winter season, so you can enjoy your deck or patio for longer. If you’ve procrastinated, that doesn’t mean you need to wait until next spring to build or start designing a show-stopping deck. Whether you’re looking at preparing your deck for the colder seasons, repairing your older and/or possibly damaged deck, or considering any improvements for your backyard, contact us today and we’ll help you with all your outdoor living space needs. Trends in outdoor living can vary from season to season, however the concept of bringing the indoors outside, is much more than a trend – it’s a desire. Creating comfortable oases that are both functional and beautiful is at the foreground of this years’ “trend”. When setting up your backyard, it’s easy to overlook how much natural light can improve the ambience of your yard. Natural light is great for relaxing, entertaining and nourishing your garden. 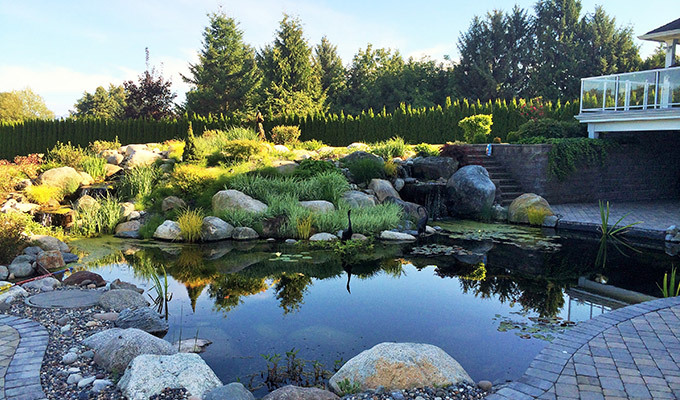 Natural light can also improve the atmosphere of your yard as it enhances the textures of beautiful architectural structures, plants and shrubs, stones and water features.